Another one done. Can't wait for #4. Very sweet fabrics, Linda. I wasn't going to do this one, but what I am seeing all over I really like them and am going to start them soon! So nice of you to stop by. I was going to make these blocks too but I am having problems with the basket handles....yours looks so nice, I don't know how you do that, they are so tiny. Have you seen "elliesquiltplace" she has a very nice free country calendar block of the month that you might like...I know we can't do them all, but it sure is fun to try. Your T-A-T BOM looks wonderful. I love you fabric selection. Aren't they so much fun to do? Cute basket. 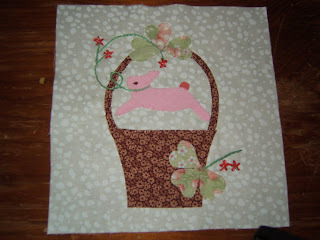 Love the pink bunny!